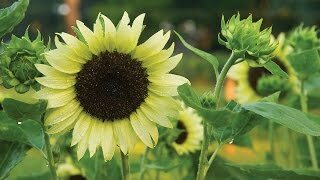 The most stunning of our giant sunflowers, with sturdy stems and lush leaves. It forms a massive wall of foliage topped off with extra large, perfectly round 10" golden flowers. Rapid growth from seed to maturity by mid-summer. Sunflower, Kong Hybrid is rated 4.4 out of 5 by 20. Rated 4 out of 5 by Acra from So far so good waiting patiently I planted the seeds feb 4th in a month they grew about 11” by Mach 4 and they are about to be 5 1/2 on April 1, some are staring to form the flower so I hope that doesn’t mean they won’t grow more :/ This is my 3rd year planting sunflowers but my first with the kong, I did planted mammoth last year and they were huge! Over 11 feet with a massive flowers but I am really looking forward for a new record from the Kong’s. Rated 5 out of 5 by KDawg57 from HUGE number of blooms! Amazing ! I bought these seeds a little late, and planted them July 14. They took off immediately, but I didn't have blooms until September (because they should have been planted June 1st. Absolutely amazing. I kept making flower arrangements for everyone. Next year I will plant near June 1 to extend the season. Rated 5 out of 5 by Andrew S from Good plant Good grower even with slightly less light than recommended. Rated 2 out of 5 by Kevin777 from Not giants, mutants I paid extra money to get the biggest sunflowers available on the market. What I got were mutants. While very interesting, it is not what I wanted. They had 5 to 20 heads and none were over 5 feet tall. Photos on request. Rated 5 out of 5 by Maribel77 from Bright sunny flowers greet friends and neighbors I planted Kong Hybrid sunflowers early in the spring and now they are like a bright line of sunshine across the side of our home! Rated 3 out of 5 by rejejdid from Not tall like the claims Sure, these are pretty decent size, mine have all bloomed and are about 7-8 feet, NONE of them are KONG size. They have had plenty of water and sunlight too.